Sticky, fragrant honey is nature’s most interesting sweetener and alwaysastonishing in the way its scent, taste and colour reflects the flora from which the bees collect their nectar. Honey from pine forests and heather moors tends to be more amber in colour, with a stronger, resinous flavour. 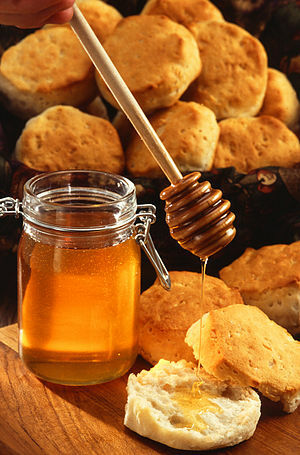 Honey from orange blossom or acacia is lighter in taste and hue. Lavender honey captures that plant’s distinctive herbaceous perfume, and manuka has a toffee-like quality. Bees like buzzing around cities, too. In Liverpool, you can buy fantastic Postcode Honey that varies with hive location (L8 for Toxteth, for instance):, and see how the flavour and colour change almost from street to street. Why is honey good for me? Raw, cold extracted honey hasn’t been heat-treated and “purified”, so still contains its full complement of enzymes and antioxidants, and has antibacterial properties. Manuka honey is most effective in killing antibiotic-resistant infections, such as MRSA. Manuka is the only honey so far that is widely acknowledged to have proven medicinal effects, but earlier this year a study at the University of Glasgow’s School of Veterinary Medicine found that heather honey also killed MRSA microbes and three other strains of pathogenic bacteria.